Brugmansia is a half-hardy tropical from southeastern Brazil, Bolivia and Peru. In the U.S., it has adapted to some parts of California and Florida. 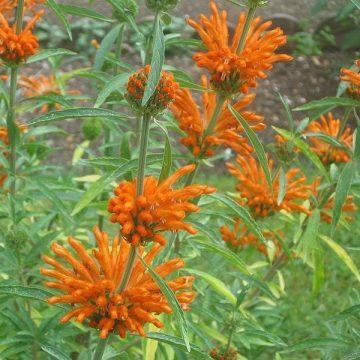 It is grown as a perennial up to zone 8b. In colder areas, cuttings are easily taken in the fall for growth the following season (see growing info). This genus’s ever-increasing popularity as a cultivated ornamental has led to numerous hybrids, such as this one. We are not sure of the exact mix of this variety. 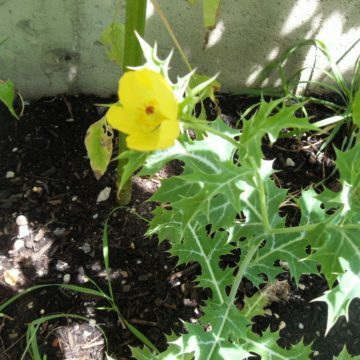 Brugmansias are prized for their gigantic trumpet-shaped blooms, with those of this variety being yellow. They are sweetly scented as well. 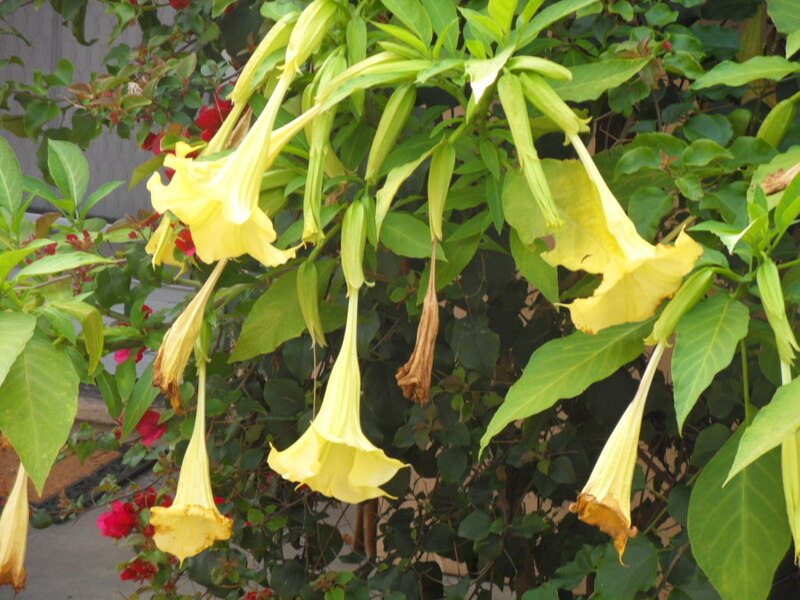 The shape of brugmansia flowers are what causes it to share the name, Angel Trumpet, with its counterpart, datura. Both Datura and Brugmansia are related in several ways with brugmansia being the tropical big cousin of datura. Brugmansias will often reach eight to fifteen feet in height where grown as a perennial with blooms measuring up to twelve inches! Unlike typical daturas, which are often referred to as thornapples, brugmansia has a smooth egg-shaped seed pod. 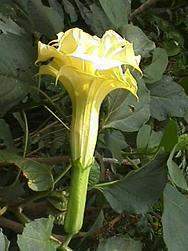 This is also characteristic of datura ceratocaula, a semi-aquatic tropical variety which has been called the link between datura and brugmansia. 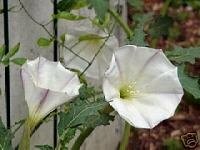 Like datura, Brugmansias contain a combination of toxic tropane alkaloids, for which it been traditionally used by various tribes for astral projection and medicine. 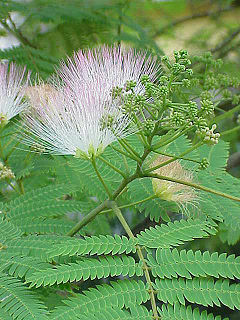 Some of those alkaloids, such as atropine and scopolamine have uses in modern medicine as well. For example, atropine can be used in eye surgery for pupil dilation and temporary paralysis of eye reflexes. 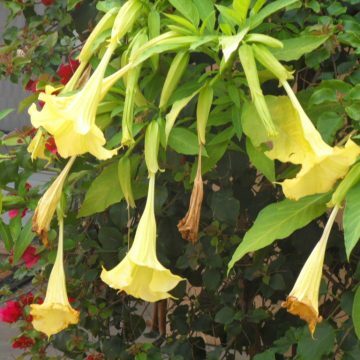 Despite these uses, brugmansia ingestion is most likely to cause complete uncontrolled behavior, sickness, hospitalization and death. All parts of the plant including the seeds are highly poisonous and should never be ingested for any purpose. Keep away from curious pets and children. Growing Information: Brugmansia is hardy to about 45 degrees Fahrenheit. In locations where minimum temperatures do not fall below this, Brugmansia can be grown as a perennial and should be cut back in the fall to encourage new growth in the following season. In colder areas, plants can be grown in 12″ pots and moved indoors for the winter. 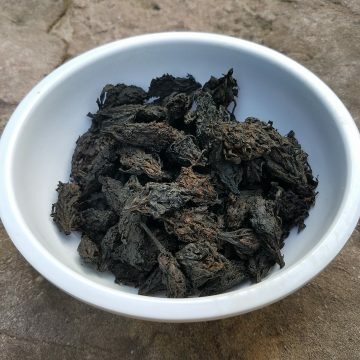 Stem cuttings are also very easily taken in the fall to be grown the following season. Simply remove an 8â€ section of new growth. Remove all but the top leaves and stand in a container with 6″ of water. Leave this on a windowsill with filtered sun and replace water as it is used or evaporated. Once the cutting has developed a sufficient root system it can be transplanted to soil. To the germinate seeds, start by soaking them for anywhere from eight to twenty-four hours. Following the soak, growers have two options: plant directly or remove the seed coat first. The advantage of removing the seed coat before germination is that it may not come off easily after the seed germinates, which can have detrimental effects on the seedling. After removing the outer seed coat, you should find a bean-shaped seed inside. Press the seed into the soil about 1/8″ deep. Soil temperatures for brugmansia must be very high or the seed will not germinate. 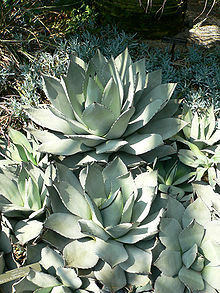 Established plants enjoy full sunlight and regular watering.